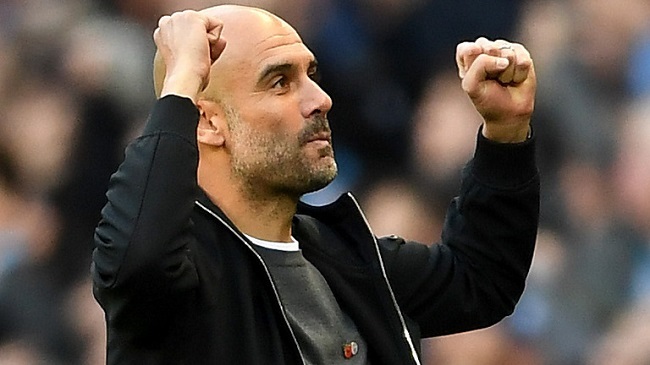 Pep Guardiola says Manchester City being in contention for the Premier League title is an achievement in itself, as his side bid to become the first in a decade to defend the league crown. Manchester City will follow Manchester United, who won consecutively in 2008 and 2009, as the last side to lift the Premier League title back-to-back with increased intrigue over the title run-in this term. Guardiola believes his side’s ability to stay with Liverpool, who have fallen behind City on goal difference ahead of the weekend’s fixtures, is testament to the strength of resolve within the squad. “I know the last five, six years, the last champions what happened to them the year after [and] in which position they were,” Guardiola said. “All of them they were out [of the title race]. They don’t have the chance in that period to win the Premier League. We are there. That is what I am delighted about the most this season. “When the people say ‘you underestimated Newcastle’, you don’t underestimate anyone when you are in the final of the Carabao Cup again and you are in all the competitions. “Chelsea, three seasons ago Leicester and the others in this period [had] no chance. We are there. That is top. That is what I am delighted about the most.